This year, graduating UCLA seniors voted to make lifetime UCLA e-mail addresses the official class gift of 2003. UCLA students will now retain their current UCLA e-mail address after commencement. The current system terminates the e-mail addresses after graduation. 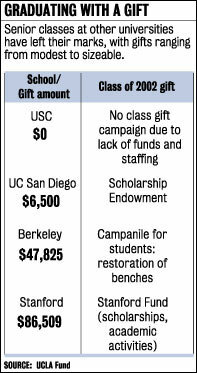 Other potential gifts on the ballot included funding for an on-campus pub in Ackerman Union and preservation of old books at the UCLA library. This year's senior class gift is the equivalent of socks. Does any undergraduate now at UCLA really need or expect to use a ucla.edu address 20 years from now? Wouldn't they be better off with, say, beer? E-mail addresses aren't exactly hard to come by. At orientation, my counselor sat me down and asked me to come up with a UCLA e-mail address no longer than eight characters on the spot. I didn't have much time to think it out properly and ended up registering an address that is, in retrospect, completely unusable. Yes, that is my UCLA e-mail address, and now I'm stuck with it for life. What am I gonna do with it? I can't give it out to people and expect to be taken seriously. It's become a glorified spam receptacle.